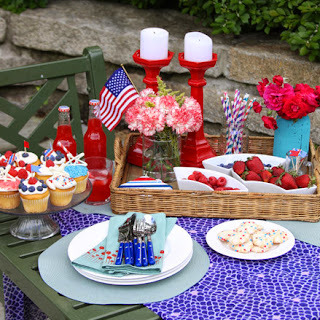 4th of July Party Ideas ~ Celebrate the 4th of July in style by adorning your home (indoors and out) with all things red, white, and blue. 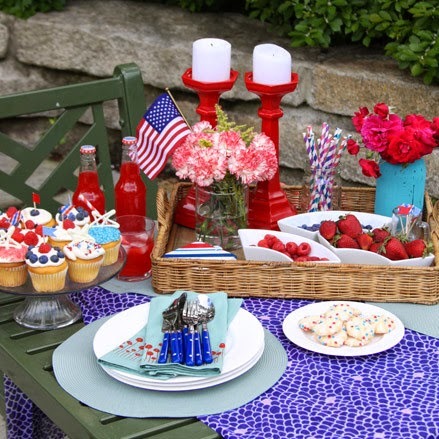 Grilling and fireworks are a given, but it's all the little extras that make it special.From easy DIY crafts to delicious recipes, bring this classic color trio to your celebration! Try a themed dinner party with an over-the-top display or simply update a sofa with patriotic-inspired pillows, like stars and stripes. Check out these tips below and get full instructions for some DIY projects! Begin decorating by scouring your house for red, white, and blue items. Don't be picky on the shades of color because a little variation in hues will make your decor more dynamic.​ For a picture-perfect table, include these foolproof accessories: bottled soda, striped party straws, fresh flowers, and a flag, of course! Step 1: Rinse the red berries. Hull the strawberries, and discard the greens. In the blender, mix all red berries, 1/4 cup milk, 1 tablespoon honey, and 1/2 cup ice. Pour red mixture a third of the way full in popsicle molds or mason jars. Immediately place in the freezer. Depending on how many molds you have, this may take a few rounds of filling and freezing. Refrigerate any extra mixture in a large bowl. Step 2: Wash the blender, and wait 30 minutes while the red mixture is freezing. Then, prepare the white mixture. Add 1 cup milk, 1/2 cup ice, and 2 tablespoon honey to the blender and mix. Remove the popsicle molds from the freezer and check to see if red mixture is almost frozen. As long as it is slushy, you can slowly pour the white mixture in each mold. Fill to two-thirds of the way full. Insert popsicle sticks through the white mixture down into the red mixture. Once again, immediately place in the freezer. Refrigerate any extra mixture in a large bowl. ​ Step 3: After white mixture has been in the freezer for about 30 minutes, prepare blue mixture. Rinse blackberries and blueberries, then add to the blender with 1/4 cup milk, 1 tablespoon honey, and 1/2 cup ice. Blend until mixed. Remove popsicle molds from the freezer, and slowly pour blue mixture into the remainder of the mold. Immediately place in the freezer, and let freeze completely (about 4 hours). Repeat steps with additional mixture for more popsicles. When it is time to serve popsicles, remove molds from freezer and let sit for two to three minutes before removing popsicles from the mold. For an easy no-bake goody that doesn't require utensils, whip up a batch of these patriotic marshmallow pops. 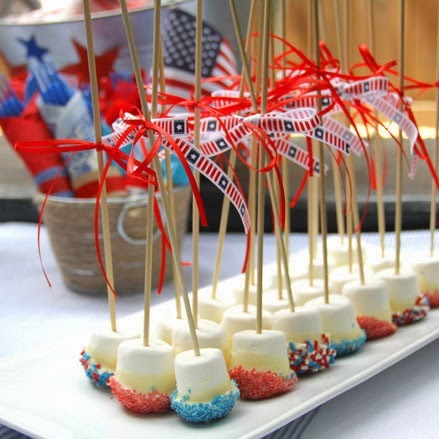 Marshmallows are stuck onto long bamboo skewers, dipped into melted white chocolate, and then rolled in red, white, and blue sprinkles. After they've had time to cool, decorate the pops with festive ribbon bows and arrange on a tray for serving. Guests can help themselves! These yummy one-bite treats are easy to customize for any holiday or celebration. Simply change the colors of the sprinkles and ribbon, or substitute the white chocolate for colored candy melts, which can be found in most craft and baking stores. Step 1: Thread regular- or jumbo-size marshmallows onto bamboo skewers. Step 2: Melt white chocolate or candy melts according to the manufacturer's instructions. Step 3: Dip the marshmallows about halfway into the melted chocolate. Allow the excess chocolate to drip away, tapping on the side of the bowl if necessary. Step 4: Before the chocolate dries, roll the marshmallows in sprinkles and place on a piece of wax paper to cool completely. Step 5: Before serving, decorate each marshmallow pop with a bow of festive ribbon. Arrange in rows on a serving tray so that guests can help themselves. 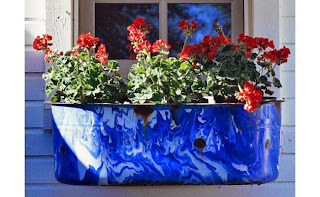 Red, white, and blue plant groupings and gardens are rare, and there's a reason for that. They can look cluttered and theme-y. Also, there are very few truly blue flowers. Most are a variation of purples and lavenders. You can't deny this blue planter box with red geraniums is super charming and patriotic. Make these oh-so-cute drink covers in four easy steps! What You'll Need: Cute cupcake liners * fun straws * mason jars *knife (to cut straw holes).Step 1. Place the cupcake liner over the mouth of the mason jar. Pull it taut. Step 2. Screw on the lid to hold the liner in place. Step 3. Use a knife to cut an "X" shape on the liner (the hole for the straw). Step 4. Carefully place the straw into the cup! July always seemed especially hot, and also the most relaxed. By July, we get get used to the idea of relaxation, and school is still a ways off. And of course, there's the 4th of July. As a child, I was always fascinated by Pepsi floats with my dad. 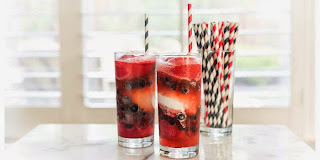 If only I had known about these red, white, and blue berry sorbet floats! 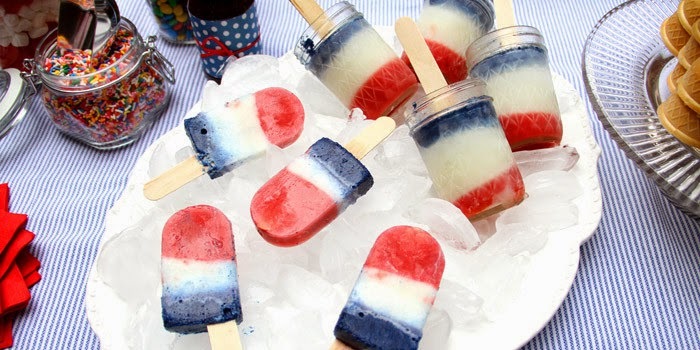 Layers of patriotic sorbet, ~red raspberry and white coconut, with the bluest blueberries (frozen, ideally)~ each sip is refreshing and light, and so, so festive. 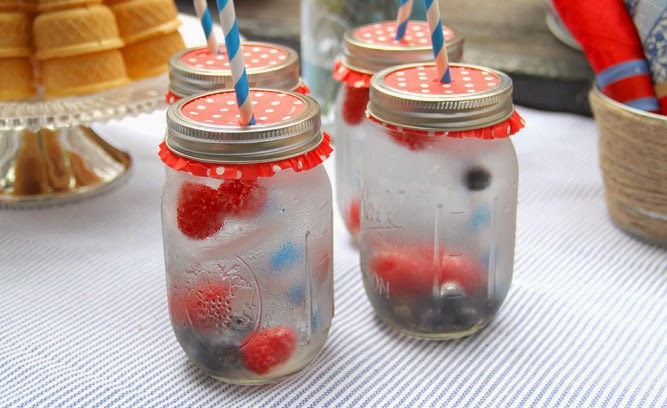 Make it a part of your 4th of July celebration, indulge in each sparkly sip and wiggle those toes in the cool grass. You'll be cooling off in no time. Ingredients: 1 pint raspberry sorbet * 1 pint coconut sorbet * 1 pint blueberries (fresh or frozen) * Your favorite sparkling juice, soda, or wine. Instructions: Use an ice cream scoop to place a small scoop of raspberry sorbet in each glass. Drop in some blueberries, followed by a small scoop of coconut sorbet. Layer with more blueberries and one final scoop of raspberry sorbet. Pour in your favorite sparkling beverage. Serve immediately. Notes ~ Sparkling juices and sodas work well for kids of all ages. But if you're hosting an elegant dinner celebration, why not sparkle things up with sparkling wine? Italian prosecco and Spanish cava are excellent choices that won't break the bank.